ROB: Top open dog … a dream to handle. Sharp, quick, responsive to every command. 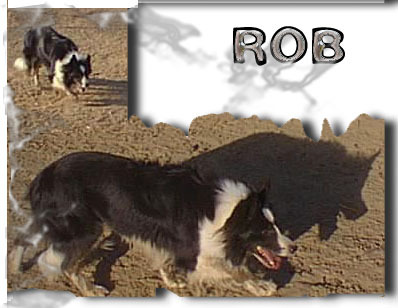 Sold as a trial dog.Rob was imported at the end of last year. He placed and won in a number of trials before being purchased and brought over here. He was also “used as a stud dog” and his pups are doing well. Rob is a small, good looking, Black and White male. He is one of the best listeners I’ve ever had and works with you instead of against you. He’s very responsive and reliable on his sheep and has just enough eye to look spectacular on but is also very good to flank. I’ve been pleased with Rob at the last couple of trials. Since this is only the third time we have trialed together we weren’t a “team” as yet but he still gave 100% each and every outing. He handled both “range ewes” and “dog broke sheep” equally well. Rob did even better on his second trial circuit where he was 7th one day and 2nd the next day thereby winning the over-all. He also qualified at the North American Championship for the double lift finals where he placed 10th.